It was over a year ago we first heard rumours of native payments within Instagram. We told you back then it would be a game changer when it arrived. And the wait is over. This week marked the official (closed beta) launch of “Checkout with Instagram” in the US. 20 DTC (direct-to-consumer) brands including Kylie Cosmetics and Adidas will be the first to access the feature. So how does it work? Let’s check it out. Using Checkout, users can complete the entire shopping journey – from discovery to delivery – all within Instagram. This is different from the Shopping feature, which still loads your website when someone wants to buy. Simplifying the purchase process and removing friction could have a big impact on conversions, and could also be a real turning point for social commerce. The Checkout button will only appear on organic posts within the feed, Stories and Explore content for now. Ads aren’t eligible. Expect this to change pretty quickly though. Payments via Visa, Mastercard, Discover and PayPal will be accepted. In future, the programme will integrate with Shopify, BigCommerce and others. But wait, there’s a drawback. Actually a few. As confirmed by the platform to Tech Crunch, brands involved will have to pay a “selling fee” to take advantage of the feature. Details of this haven’t been revealed yet. There’s also a data consideration for companies using Checkout. Although Instagram will likely provide insights, the data volume and depth is unlikely to match what you get from actual website visitors. Also, less people visiting your website will mean less opportunity to browse and encounter a broader range of your products. Even given all of this, we predict Checkout could be a big deal. Hidden deep in the code of any social media app lies a treasure trove of secrets. Details of unreleased features being tested undercover are there for anyone to see. Assuming you can code-hack that is. Luckily some people can. Including reverse-engineering specialist Jane Manchun Wong, who revealed a potential new Pinterest feature when exploring the app’s Android code this week. As you can see, it looks like the platform is about to release a dedicated video tab on profile pages. Over the years, Pinterest has shown increasing interest in video. After enabling native uploads and autoplay, it also introduced max-width promoted video ads. The potential of a tab exclusively for video content suggests there will be even more focus on the format in future. It also suggests Pinterest knows users consume/categorise video content slightly differently and therefore would appreciate a section featuring only this type of pin. If this rolls out, we could see a shift from brands towards producing more, and better quality, video content. A report from Cheddar has revealed Snapchat will soon be announcing an in-app gaming platform, featuring a range of games from outside developers. You can already enjoy a range of AR games called “Snappables” through Lens. But this new platform would take things up a level by introducing a more comprehensive range of games. With Snapchat’s young core demographic, this seems like a great move. It will also give the app a new differentiator to help stem the loss of users migrating to Instagram. It could help the company drive revenue through in-app purchases and advertising too. In all honestly, the news isn’t a massive surprise. Chinese tech megaforce Tencent acquired a 10% stake in Snap Inc. back in 2017. As reported by Social Media Today, Tencent not only operates WeChat – the biggest messaging app in China – but is also the largest gaming company in the world by revenue. In addition, Snap Inc. reportedly acquired small Australian gaming company Prettygreat for $8.6m only last year. Overall, Snapchat seems to be on the up at the moment. As well as the move into gaming, it recently enjoyed a surge in share price following a positive earnings report. On top of this, it’s redesigning its Android app, which it hopes will revive growth. This one is short and sweet. 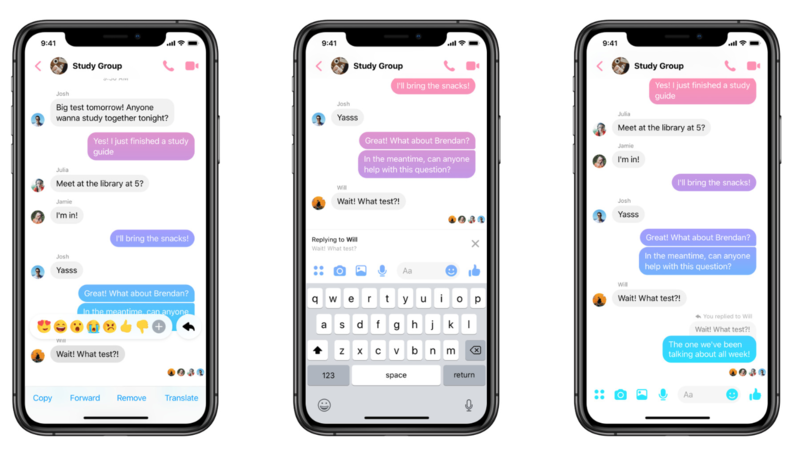 Facebook has done all users – and community managers – a favour by introducing quoted replies to Messenger. While this feature already exists on other chat apps like WhatsApp, it was noticeably absent from Messenger until now. This means you’ll be able to reply to specific messages within a conversation. Your reply will still appear as the latest message but it will quote the message you’re responding to, making chatting in groups (or to someone firing a million questions your way) a breeze. The announcement of this closely follows the launch of a message “unsend” feature. Both are part of Facebook’s bigger goal to simplify the messaging experience. A recent infographic from Design Advisor used 14 case studies to highlight the importance of good web design and identify trends for 2019. As with any stats or study, sometimes more context is needed before letting the findings heavily influence your strategy. However, looking at this infographic, there’s some really valuable tips and advice – most focused on improving user experience and conversions. So I don’t think you can go far wrong.